Over the past few months, we've been getting more sustainability-related inquiries from you which is such good news. We're really happy to see that more and more are not just interested but truly invested in switching to a more natural and sustainable lifestyle. Cheers! We're so excited to take on this journey with you! 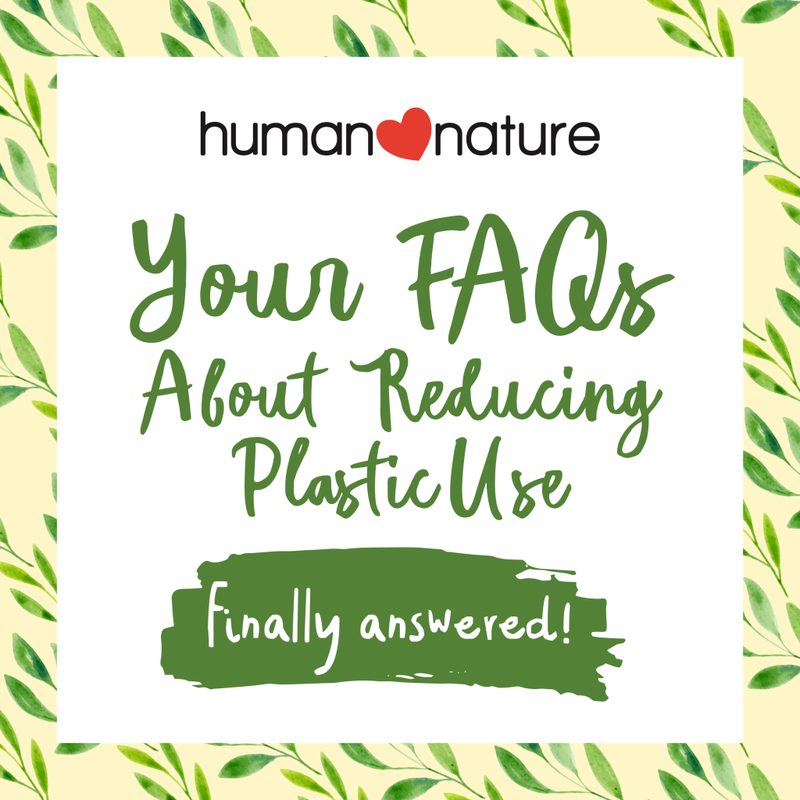 And to kick things off, we've collected our most frequently asked questions about sustainability and reducing plastic use and answered them as detailed as possible so you can also share these to friends and family who are just starting their own transition. Have questions that aren't on the list? 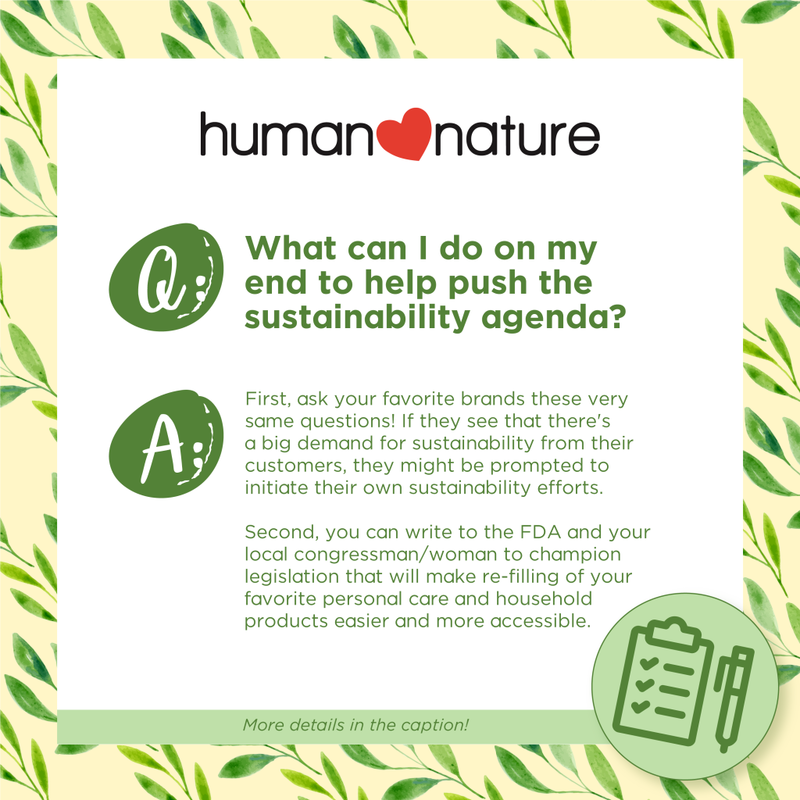 Just email your questions to customer.service@humanheartnature.com and hey, you never know, they might be included in our next Q&A! 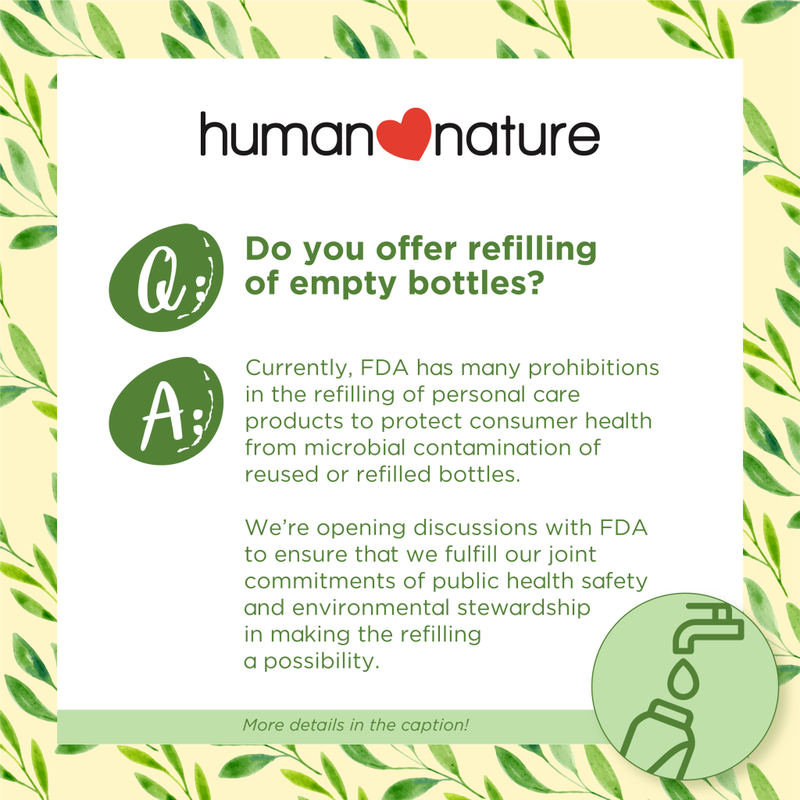 Q: Do you accept and recycle empty Human Nature bottles? A: We currently are partnering with Museo Pambata for a Sining Bote Recycling Program. 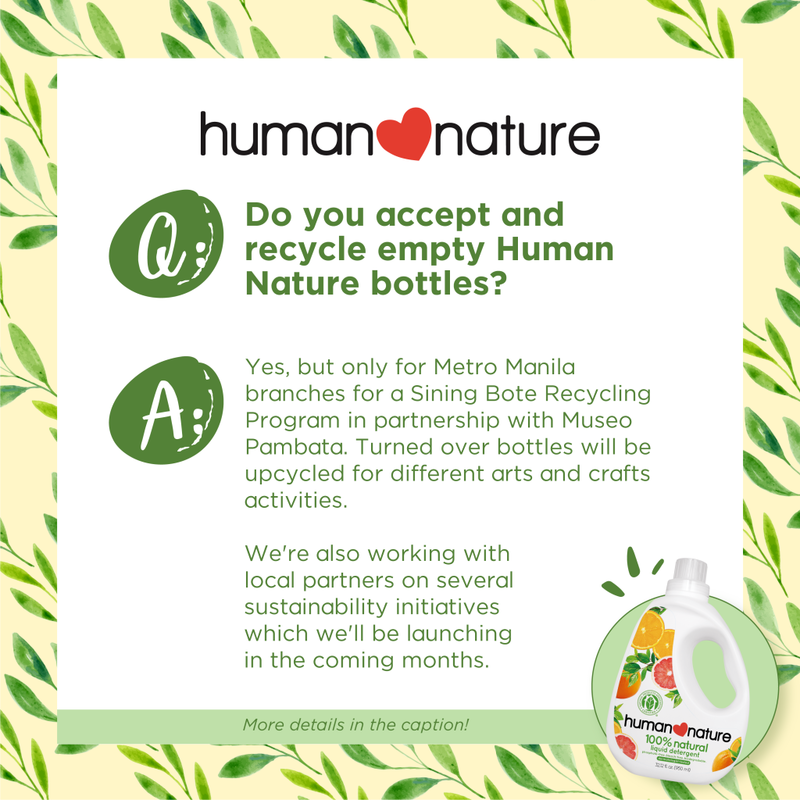 Customers can turn over their clean and empty Human Nature bottles to Metro Manila branches. These will then be turned over to Museo Pambata to be used for their different arts and crafts activities. Check out more info on this goodness project. Further to the partnership with Museo Pambata, we are currently working on several sustainability initiatives with local partners to either reduce plastic use or recycle the plastic that we currently use. We will be launching these various programs in the coming months. Q: Are you planning to have biodegradable packaging in the future? A: We have been in talks with several local plastic suppliers for the last 3 years. Unfortunately, the technology has not yet been commercially available in the Philippines. We have even reached out to international plastic suppliers even though the costs would have really drastically increased the prices of Human Nature products. 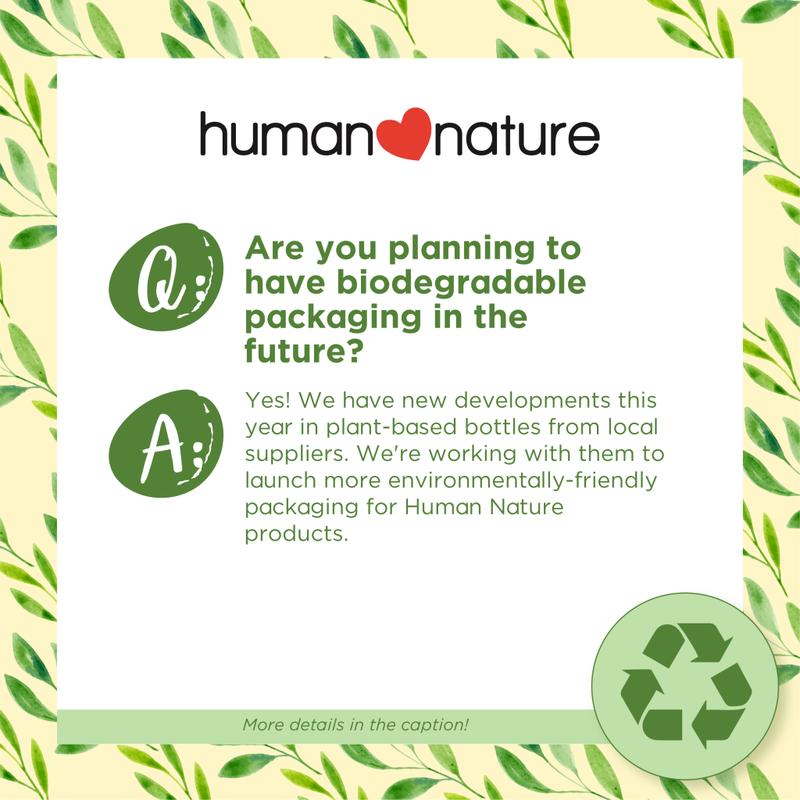 The good news is that just this year, we’ve had new developments in plant-based bottles from our local suppliers and we are currently working with them to launch more environmentally-friendly packaging for Human Nature products. Q: Do you do product refills? Rest assured that our team is working hard to lobby all the requirements as well as the legal aspects of the activity to ensure that we can stay true to our joint commitments of public health safety and environmental stewardship. The United States and some countries in Europe have successfully been able to set up refilling stations for personal care products that safeguard against product contamination and we intend to follow their template to ensure that we are able to refill products safely. Companies who conduct refilling of personal care products without securing license to operate are at risk of serious penalties including criminal cases from the health authority. Our products are natural and we need to consider a lot of things from the raw materials that we are using, our process and the use of packaging materials. One of the main consideration for refilling is the sterilization of the used bottles. Sterilizing means the packaging has to go through high temperatures to make sure they are truly cleaned. Most plastic bottles are not recommended to be heated to high temperatures as this releases harmful chemicals into the air. Q: What can I do on my end to help push the sustainability agenda? STEP 1: Get your free letter template from Save Philippine Seas here. - or your local congressman/woman. Who's your congress representative? Find out here. Their contact details are listed there as well. TIP: More often than not, representatives have their own official Facebook page. You can also try searching for them on Facebook and message them there. STEP 3: Fill in the free template and send it! And you've done it! Good job! Spread the news to your family and friends as well. We also encourage you to extensively research and understand the challenges of refilling so that together, we can push for sustainability programs and policies that will be seriously considered and prioritized by the authorities.